I am pleased and proud to announce that after years of sweat, swearing, and suffering, Lucky Dog, the long awaited sequel to my swords and sorcery adventure/fantasy Magical Misfire is now available on Amazon. Check it out HERE. And just to be a nice gal, I'm making the e-version available for just $2.99 until the end of March. 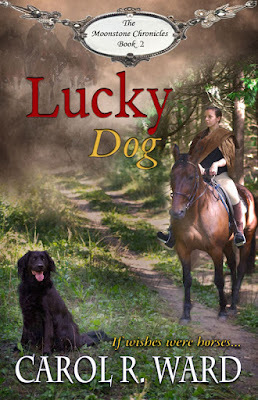 Right now Lucky Dog is only available from Amazon. Sorry about that, but I'll let you know about the other e-formats as soon as they're available. And keep your eyes peeled for the upcoming Goodreads contest where you can win a paperback version.